Longview, TX, October 3, 2017: Approximately 500 administrators, practitioners, caregivers and those who work with the senior population will receive training October 4 and 5, 2017, at the 26th Annual REACH Conference (Regional Education on Aging, Caregiving and Healthcare) at Maude Cobb Convention and Activity Center in Longview. 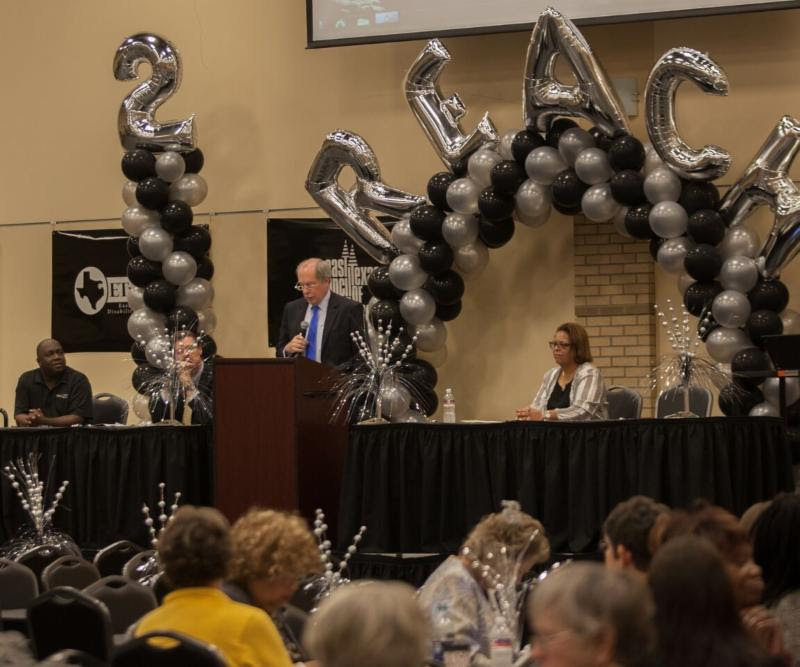 The Conference is hosted each year by the Area Agency on Aging (AAA) which is administered by the East Texas Council of Governments (ETCOG). The conference, themed "NAVIGATING THE FUTURE: PEOPLE. PURPOSE. PASSION." celebrates the compassion of people who provide aging services and highlights the purpose and passion of what we do for senior populations. REACH is a collaborative effort to provide educational workshops, plenary sessions, and networking opportunities for professionals, caregivers, and anyone interested in aging issues. "Once again, there is a distinguished line-up of speakers set to take the stage and captivate the audience at this two-day event. Taking into consideration the diversity of aging concerns, we have attempted to include local, regional, and state service providers and educators to address a variety of topics that may be of interest to anyone who works with older adults, their caregivers, or their families," says Bettye Mitchell, Director of Aging Programs for the Area Agency on Aging. Special speakers include: Deborah Moore, Director of the Harris County Area Agency on Aging and Care Connections Aging and Disability Resource Center, and President of the Teas Area Agencies on Aging; Nyla McCarthy, a fierce advocate and educator bringing discussions on ethics to the conference; Missy Buchanan, a motivational speaker encouraging attendees to connect with the human spirit as they work with older adults; John Ford, speaking on the importance of care plans; Jose Feliciano, sharing a personal story on the importance of caregiving; and Piper Dellums, closing the conference with her insights on "The Purpose of Passion." REACH is partially funded by the Texas Health and Human Services Commission. This year's Gold Sponsors are At Home Healthcare; East Texas Aging and Disability Resource Center; CIGNA HealthSpring; Civitas Senior Living; Copeland Insurance Group; Heart to Heart Hospice; Southwest LTC; Texas Home Health, Hospice & Personal Care; Silver Sponsors Brentwood Behavioral - Shreveport; Brookdale Senior Living; East Texas ADRC/Housing Navigator; East Texas ADRC/Local Contact Agency; Gateway Dental Management Services LLC; Outreach Home Care; Bronze Sponsors CHRISTUS Good Shepherd Health System; Encompass Home Health; Haven Care Nursing & Rehab; Highland Pines Nursing and Rehab Center; Mom's Meal NourishCare; Right at Home; Ross & Shoalmire, LLP; Texas Oncology - Longview; Bag Sponsor, Buckner Westminster Place; Badge Sponsor, Genesis Healthcare Clairmont Longview; and Keynote Sponsor, PhyNet - Longview Life Center. REACH is organized by a planning committee made up of 14 state and local agencies. The REACH schedule can be viewed here. For more information, call the Area Agency on Aging of East Texas at (903) 218-6500 or visit our website at http://www.etcog.org/404/REACH-Conference.htm. For further updates and additional information, follow us on Facebook at Area Agency on Aging of East Texas. The Area Agency on Aging of East Texas is designated by the Texas Department of Aging and Disability Services to coordinate services for persons in East Texas who are 60 or older, with particular attention to low-income minority older individuals, older individuals with limited English proficiency, and older individuals residing in rural areas. Programs include, but are not limited to: Information, Referral and Assistance, Benefits Counseling/ Legal Assistance, Nursing home Ombudsman, Care Coordination, Caregiver Support Program and transportation provided by GOBUS. The Area Agency on Aging provides Nutrition programs delivering hot, nutritious meals to eligible homebound senior and providing congregate meals at local senior centers. The Area Agency on Aging is a program of ETCOG serving its 14 county region. The East Texas Council of Governments (ETCOG) is a voluntary association of counties, cities, school districts and special districts within the fourteen-county East Texas region. ETCOG assists local governments in planning for common needs, cooperating for mutual benefit and coordinating for sound regional development. Established in 1970, ETCOG, either directly, or through its contractors, provides programs and services for East Texas seniors, employers, and job seekers. ETCOG and its contractors also build the 9-1-1 emergency call delivery system, provide peace officer training and homeland security planning services, deliver rural transportation services, business finance programs, and environmental grant funding for the region.